An emergency meeting of the assembly to discuss Israel's storming of an aid flotilla bound for Gaza, in which nine people died is under way. MLAs are debating a motion calling on Israel to end the blockade and allow safe passage for the Irish ship, the Rachel Corrie. Nobel Laureate Mairead Corrigan Maguire is among those on board. The debate was supported by at least 30 MLAs, the number required before the assembly can be recalled in this way. However, the DUP's William Irwin said it was "nothing more than a publicity stunt". "The situation in Gaza was raised in the assembly chamber on Tuesday and there is absolutely no need for another separate debate to be called on a day when the assembly is not even sitting," he said. "At a time when we are facing massive cuts in public spending there are a huge range of more important issues which should be concerning public representatives in Northern Ireland." The Rachel Corrie is due to arrive in Gaza on Saturday morning. 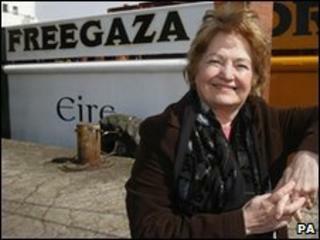 On Friday, crew member Jenny Graham said they remained determined to dock in Gaza. "With regard to the suggestion that we have been negotiating with Israel about docking in Ashdod, again this is untrue. "The Israelis have not been in contact with us. We remain as committed as ever to getting our 1,000 tonnes of aid and supplies to the people of Gaza," she said. Nine civilian activists were killed after armed forces boarded the largest vessel carrying aid to the Gaza Strip on Monday. Organisers of the flotilla said at least 30 people were wounded in the incident. Israel says 10 of its soldiers were injured, one seriously. Israel had repeatedly said it would stop the boats, calling the campaign a "provocation intended to delegitimise Israel". It says it allows about 15,000 tonnes of humanitarian aid into Gaza every week.